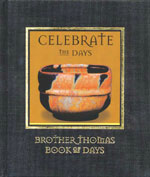 A perpetual Day Book of over 50 full-color photos of Brother Thomas Bezanson’s porcelain tea bowls and accompanying quotations from his writings. A perfect gift for those who love the beautiful. Brother Thomas was artist-in-residence at Mount Saint Benedict Monastery in Erie, PA, until his death in August 2007.